Looking through the The PDMA Toolbook for New Product Development I found this little nice snippet about how the ubiquitous 3M Post-it note come about. Seems like it’s sometimes worth sticking to an idea (pun intended) in case you find a good use for it. 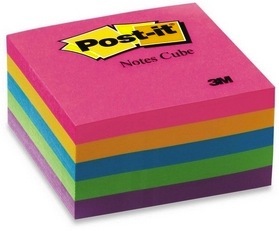 An example of looping back and iteration took place when Spence Silver at 3M ﬁrst identiﬁed the strange adhesive that was more tacky than sticky and which later enabled the development of the 3M Post-it notepads. Initially there were no product ideas for this concept—though Silver visited most of the divisions at 3M in order to ﬁnd one. The initial idea was to develop a bulletin board coated with the tacky adhesive, to which people would attach plain-paper notices. This concept was never realized, and a new concept, which eventually became 3M Post-its, was later proposed by looping back into opportunity identiﬁcation and opportunity analysis from idea generation and enrichment. The engine for the 3M Post-it notepads was a culture that allowed the inventor of this unusual adhesive to champion his new technology for many years in spite of the fact that no recognized application or customer need existed. Reading the Wikipedia entry, I don’t really see a serious discrepancy. I think the main message still remains – not to discount your innovations and inventions too early and keep looking for applications. Also, that a company culture that allows for this, can be more effective at creating innovations. they were looking for glue that would never release. and yes, they turned it into a succes by accident..